In celebration of MTN's prestige anniversary, MTN has decided to reward some of it's loyal customers with free airtime and data. MTN is currently giving out free 120 minutes worth of airtime to call any network and 750mb free data. The free data plus airtime which is valid for 7days (1 week) is only available to a few selected customers. 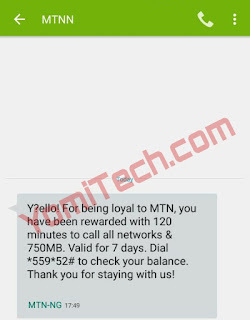 So if you are qualified, you will most likely receive a text from MTN or you can also dial *559*52# to check. As I said earlier, the 120minutes free talk time can be used to call any network and the free 750mb data works on all internet enabled device but can't be shared. 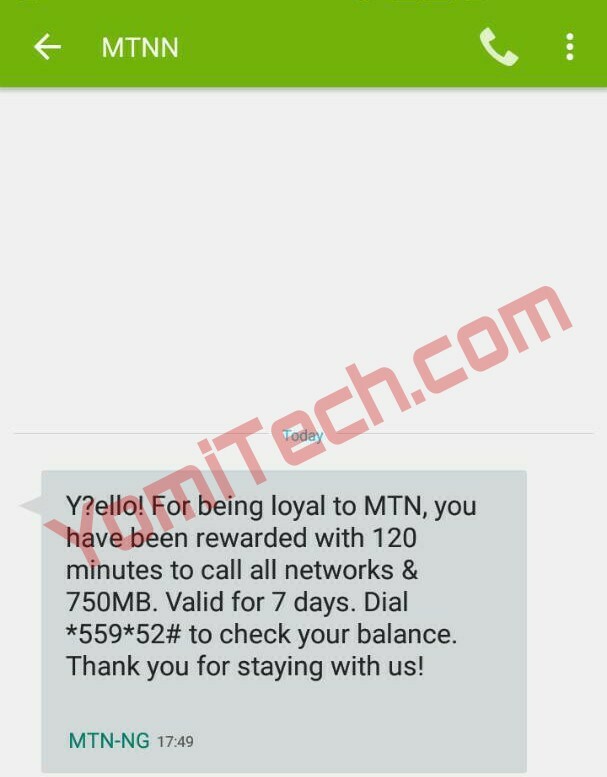 If you happen to be one of the lucky MTN customers, feel free to share your testimony in the comment section below.